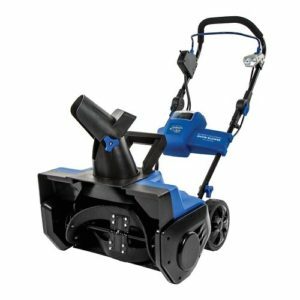 The Yardmax 2-Stage Snow Blower 22 in is a basic snow blower that will meet the needs of most consumers with a smaller driveway and limited amounts of snow. It is only 22 inches wide making it easy to store in cramped garages or small sheds. It does not come with features that some of the larger machines come with such as a light for night time work, steering controls and electric starter. The handles are not insulated and they are also not heated. 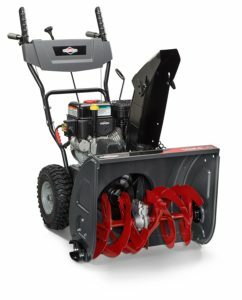 this is a basic snow blower that comes with a relatively low price as well. Buyers should be aware that because of federal laws this machine cannot be returned for any reason. 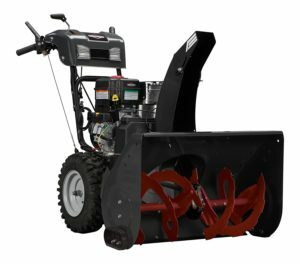 The Yardmax 2-Stage Snow Blower 22 in comes with a manual chute control crank which is easy to operate, clears a 22 inch wide path and has five forward gears to adjust to a variety of snow conditions from light snow clearing to heavy conditions. Since it is a smaller machine, allow more time for clearing driveways and walkways. 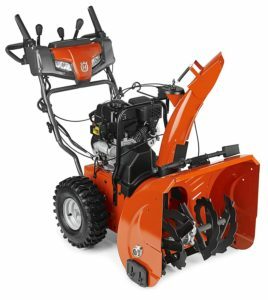 The Yardmax 2-Stage Snow Blower 22 in has a total of 62 reviews at the time of preparing this overview, with an average rating of 4.2 out of five. 53 reviews were 4 or better with 9 rated three and 9 rated below three. Negative reviews tended to indicate that the product was cheaply made and customers had problems from the time it arrived. From not starting to damage in transit to poor customer service. Assembly was difficult for people who had do it yourself skills. Positive reviews indicated that it was a great product for the price, assembly was easy and straight forward and the machine worked as advertised. Although it did not have a great deal of features, the price was right and it did the job for these customers. It should be noted that this is a small machine. Consumers with large driveways or lots of snow to clear may want a larger more powerful machine to make the job of clearing snow easier and quicker. 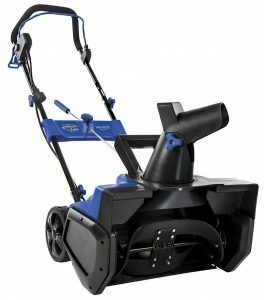 The Briggs & Stratton Dual-Stage Snow Thrower with 208cc Engine and Electric Start, 24″ is an excellent consumer snow blower. 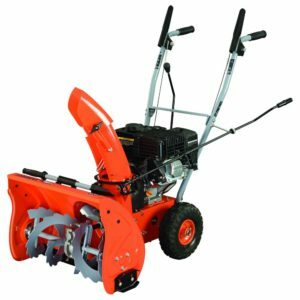 Although fairly narrow compared to many snow blowers, its narrow shape allows for easy storage. This can be important for people with small garages and not a lot of storage. It has the basic features needed by most consumers with a reasonable price. Electric start and hand controls for blower direction and steering. This product does not ship to Canada. Even if you have larger spaces to clear, this snow blower will do the job for you, it just may take a little longer. It uses regular gasoline. Reviews indicate a 76% positive rating with a 4 rating or higher. Some customers reported service and customer service issues with the supplier. This is a great little machine for most consumers. As of writing this review, there are 204 reviews on Amazon, with 76% of the ratings at 4 or better. The customers reporting 3 or lower reported problems with service, damages when delivered and gear disc slippage. the majority of customers found this product met their needs and were very happy with the product. 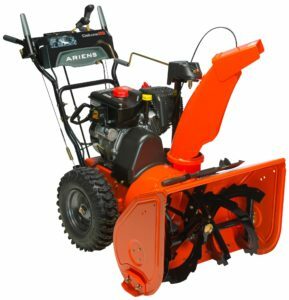 For more information about 24 inch wide snow blowers, click here. 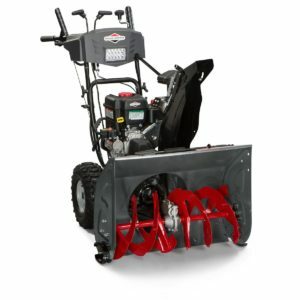 The Briggs & Stratton 1530MDS Dual Stage Snowthrower Snow Thrower, 306cc is a relatively new machine with only one customer review. On paper it looks good with lots of features, including heated hand grips and remote chute control. This machine can be operated with one hand while making steering adjustments as well as controlling the chute direction. This is one of the larger snow throwers available on the market. On a practical level consumers should ensure they have sufficient room to store a 30 Inch wide machine in their garage or storage shed. It is also more powerful than some of the smaller machines available. 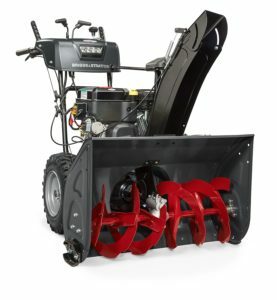 If you have a great deal of snow to clear, this is the right snow thrower. Long driveways and sidewalks are excellent applications for this snow thrower. 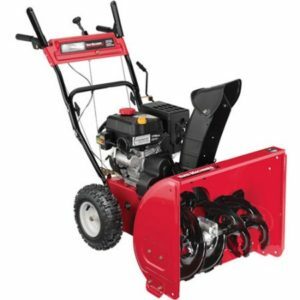 There was only one review available for the Briggs & Stratton 1530MDS Dual Stage Snowthrower at the time or preparing this review and it was not a good one. The snow thrower was delivered to the wrong address for starters and evenutally to the right location in a damaged state. Consumers is still looking for compensation.